Since its inception, Schiavone Construction Co. LLC has recognized the benefits of careful integration of its professional engineering staff with its daily operations. For over 55-years, the Schiavone Engineering Group has called upon the expertise, creativity, innovation, and willingness of its personnel to think “out-of-the-box” to develop safe, cost-effective solutions to complex construction challenges. From the structural analysis of 3-D computer models to dealing with the real world logistics of deadlines, budget constraints and restrictive working conditions, The Schiavone Engineering Group provides engineering, design and project management support for the planning, execution, administration, and management of all Schiavone projects. Economic conditions and limited funding have compelled Public Owners to explore alternative methods of project delivery. Design/Build and/or the more recent P3 programs have transferred much of the engineering responsibility to Contractors, creating career opportunities for engineering professionals. The Schiavone Engineering Group plays a leading role in the planning, execution, and oversight of the entire design process to ensure successful results. The Schiavone philosophy is to pair senior and junior engineers together to collaborate on new ideas and best practices. Many of our engineers follow the work product from the office to the field where they take part in the actual construction process, including the resolution of problems and related issues with Owners, subcontractors and suppliers. Because of the diverse nature of the work, members of The Schiavone Engineering Group are exposed to multiple technologies and often develop strong backgrounds in surveying, steel and concrete design and geotechnical analyses. Staying current with the latest developments in the industry is encouraged and training through specialized seminars is offered. The Schiavone Engineering Group also has a leading role in the planning, execution, monitoring and administration of the entire construction process. 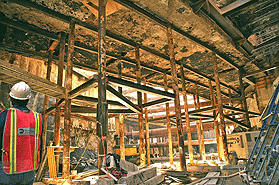 Through the use of modern CPM scheduling techniques, construction progress is evaluated, alternative approaches are analyzed, and corrective measures are implemented. Our personnel are constantly observing the construction activities from large-scale priorities to the small details to maintain productivity and efficiency. Project Management also serves as a sounding board for the Project Teams, often providing recommendations and direction so challenges are quickly resolved before the schedules are impacted. 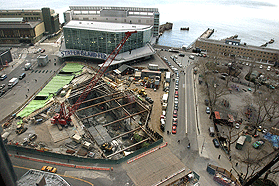 The Associated General Contractors of America and AON Construction Services Group presented Schiavone with the Best New Design-Build Project for the new South Ferry Terminal Structural Box in 2010. Schiavone Construction Co. LLC along with Joint Venture partner, Granite Halmar, was among 15 companies to be recognized during the annual ranking of the nation’s most significant construction projects.